Bring the shop to the consumer ! One of the good things internet has brought to retailers, is the possibility to "open" a shop without any premises or rent or window, yet offering a very large range (long-tail!) of products, for consumers to see and buy. And when you mix both, you can get a great operation ! 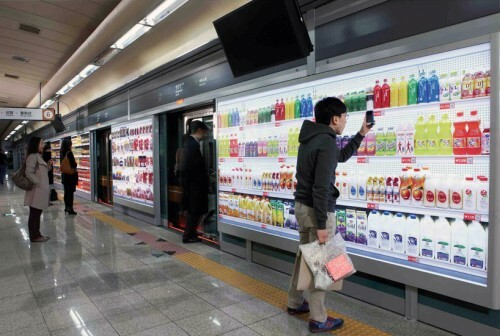 As designboom explains : In a campaign designed by the seoul branch of advertising agency cheil, Tesco homeplus supermarket opened last fall a virtual grocery store in a south korea subway station, permitting users to shop using their smartphones. A large, wall-length billboard was installed in the station, designed to look like a series of supermarket shelves and displaying images and prices of a range of common products. each sign also includes a QR code. Users scan the code of any product they would like to purchase, thereby adding it to their online shopping cart. After the web transaction is completed, the products are delivered to the user's home within the day. As you can see in this video, this was a fantastic (and not so expensive) solution to get visibility, increase website visitors, gain online sales, and improve marketshare!! A good "sticky" way to make your customers more loyal, and a good return on investment!